As we move into 2013, I’m thinking about new things I want to try on the blog, and one of them is to write about the films I see. I challenge myself every year to watch 52 new-to-me films, and I thought I’d write a blog post on each and every one. They aren’t reviews, just my thoughts, in bullet point form. I’m starting with The Hobbit: An Unexpected Journey, even though I technically saw it in 2012. I’m a Lord of the Rings junkie (films more than books), so I loved all the references; Gandalf acquiring Glamdring and giving Bilbo Sting, the hints of Sauron’s return to power, Bilbo sitting down to write his tale on the actual day of the party from Fellowship of the Ring, Gandalf hitting his head in Bag End. All of them. Fantastic performances from Martin Freeman, Ian McKellen, Andy Serkis and Richard Armitage. Richard Armitage: so attractive, even as a dwarf. The score. So like Lord of the Rings, with the Hobbit and ring themes that we know and love, but still distinctive. Gollum. I felt the whole cinema bristle with excitement when he finally appeared. Brilliant character, masterfully played. The sound. I’m a big fan of good sound in a film, and it was fabulously done throughout, especially in the forest. The scene between Saruman, Gandalf, Elrond and Galadriel. Gandalf being taken to task like a naughty schoolboy was so at odds with the Gandalf we know from Lord of the Rings. Elrond in his fighting gear (as opposed to his cloaks). I’m a bit of a closet Hugo Weaving fan. Hearing Galadriel’s voice. It was the first and only time a female spoke throughout the whole film! Gandalf having really dirty fingernails. I appreciated the level of detail; Gandalf the Grey looks so dirty (I love it when he becomes Gandalf the White in The Two Towers because he’s so much cleaner), had he been seen with immaculate fingernails it would have been rubbish! It was too long. The section at Bag End was excessively long. I love Frodo Baggins as much as the next person, but I felt Elijah Wood’s cameo was largely unnecessary and just added to the length. I believe that his appearances will bookend the trilogy, but I just kind of wanted to get to the story, and see Martin Freeman. As attractive as Aiden Turner is (though he’s really not my cup of tea), Kili and Fili felt largely like Merry and Pippin Mk II, and they weren’t as entertaining. All in all, I bloody loved it, and the fact that I could only think of three negative points speaks volumes. I can’t wait a whole year for the next instalment, so I might just get into bed and watch The Fellowship of the Ring. Again. 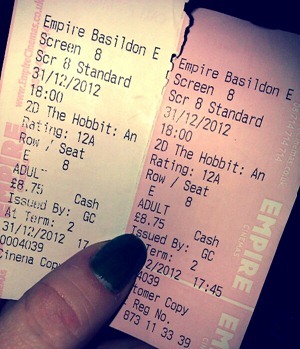 See, I was humm-ing and haw-ing about watching The Hobbit, but after catching 20 minutes of LOTR on the TV the other day I got really excited, and remembered what it was like to go to the cinema three Decembers in a row to watch a LOTR film. My biggest issue is its length – it’s a shorter book! – and the fact it’s been split into three films. What?! I will go to see it though, it’s inevitable! If you are a LOTR fan you have to see The Hobbit! If it’s just the length that is putting you off, just be prepared to get a bit of a numb bum! I think it’s definitely worth it. Everyone is saying it’s too long. I’m supposed to be going to see it this evening. I’m going in with low expectations so should enjoy it. What did you think? I think the length is a problem, but I enjoyed it so much that I am willing to overlook it!